I just finished a small piece, Wren in Rome…. It is on my favorite paper – Art Spectrum Colourfix Suede paper and I used the entire line of Caran d’Ache pencils: Luminance, Pablo, Supracolor II and Museum Aquarelle. I absolutely love their pencils and have confidence in their quality and lightfastness for fine art works. 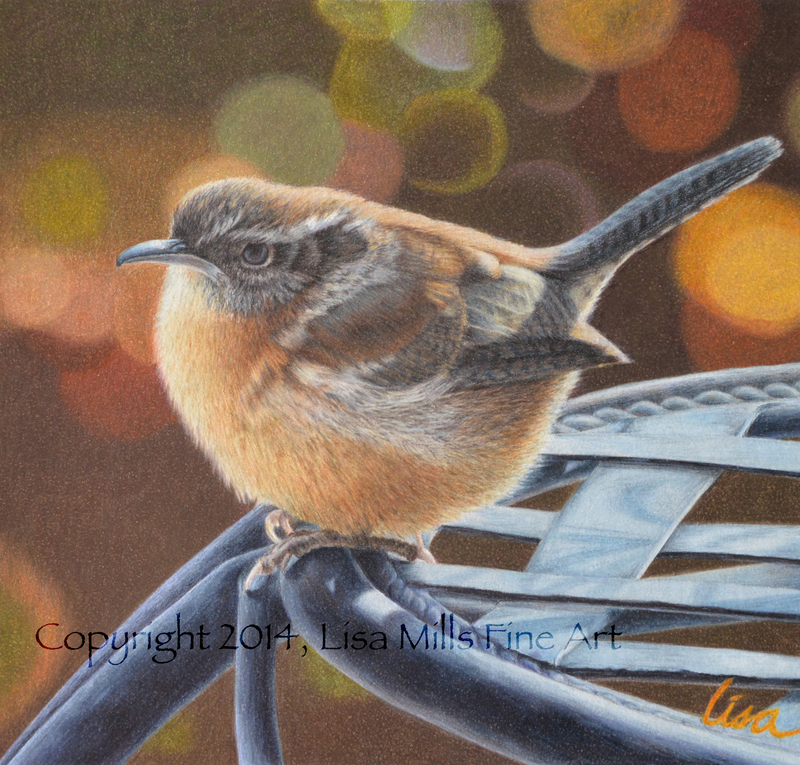 I took the reference photo of this little wren early in the morning. The effect of the light on the shrubs in the background was stunning and provided a dramatic backdrop to the little bird. I also loved how the warm light washed over the bird from the back and provided a contrast against the cool hues of the chair he was perched on. The chairs are actually a faded black metal, that when washed with light, appeared blue grey. 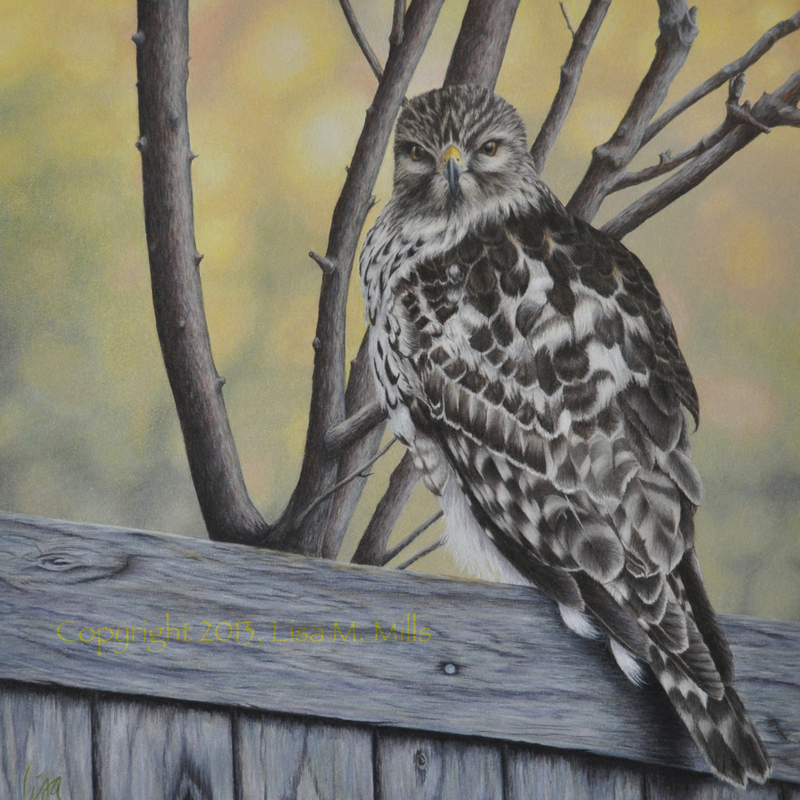 This is my first piece as a Signature Member of CPSA, however I didn’t sign the piece as such. I’m so pleased to announce that Morning Preyer has been accepted into the CPSA 21st International Exhibition this summer in Brea. It was one of 127 entries accepted of over 600 entered. While I’m excited for this piece to be accepted, I’m disappointed that Reflections on Cool Jazz was not. I can still enter it again next year, and plan to do so. This is the second time my work has been accepted in the international show and if I’m accepted a third time, I will receive signature status in CPSA. The show this year is in Brea California the last week of July. I’ll be attending the show and look forward to seeing the exhibition in person. After recently completing “Reflections on Cool Jazz,” I discovered an opportunity to enter the piece in a Texas-only art competition. The competition known as The Hunting Art Prize is held annually in Houston and is one of the nation’s more revered art competitions. It is limited to artists living in Texas and limited to two-dimensional drawing and painting pieces using only traditional media (pencil, pastel, paint, etc.). No sculpture is admitted, nor is photography or graphic art (computer generated). The piece must be available for sale. Juried pieces are on exhibit in Houston in the spring and only one is selected as a winner. Even though I was planning on entering ‘Cool Jazz’ in the CPSA International Exhibition in 2013, I have changed my mind and am taking a shot at this prestigious competition. 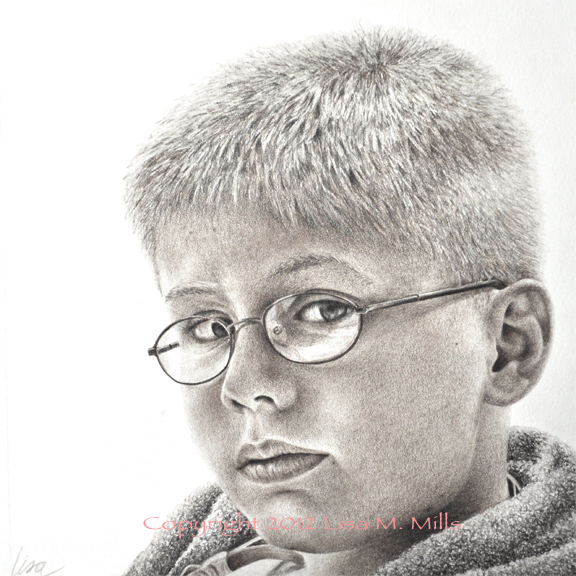 If it is not accepted, I will then enter it in the CPSA show. Let’s see how the judges like colored pencil artwork!